Fabric preparation affects the amount of fabric you’ll need and determines how you’ll wash your handbag after it’s complete. You’ve been to the fabric store and chosen the best fabric for your bag. You’ve made your purchase, and are ready to start cutting. But wait, do you need to wash your fabric first? That depends… You’ll need to answer a few questions first. Do you anticipate that the article you’ll make will need to be washed in future? If you are making a wall hanging or a show quilt, or something else that will be displayed but not handled on a daily basis, the likely answer is no, and you can go ahead and start cutting. However, if you are making a purse, you will probably want to freshen it up with a once a year wash. For something like a baby quilt or an everyday quilt it’s certainly going to be laundered at some stage and possibly in hot water – you will definitely need to pre-wash in that case. But there are exceptions. For instance, you don’t want to pre-wash if you are making a rag quilt. Sometimes the decision to pre-wash depends on the pattern requirements. If the handbag pattern uses Fat Quarters (18” x 22” rectangles), I’d suggest you should not pre-wash because it may leave you short on fabric. Later on, if your bag requires laundering, hand wash it instead of machine washing. The Essentials Tote is an example of such a bag. 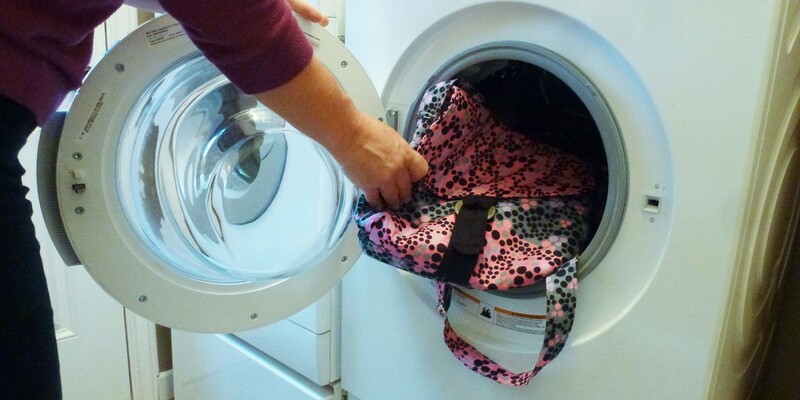 Will you be throwing your bag into the washing machine or hand washing it in cold water? Hand washing: you could get away with not pre-washing. Washing machine: you’d best pre-wash.
Keep in mind that fabrics are treated with anti-fungicides and are also pest proofed by the manufacturer. You’ll definitely want to wash off that residue before using it to make an item for a baby or an allergy sufferer, or even just for your own good health. There’s another practical reason to pre-wash the fabric you’ll use to make your bag. Removing any chemical residue on the fabric allows fusible stabilizers and interfacings to better bond with the fabric. What about the dye in your fabric? If you suspect that a fabric color might run, it’s better to wash it now and use one of the new products created to affix the dye, like Retayne®, in the wash water. There are also dye ‘grabbers’, sheets that are added to the laundry that attract any stray dye in the water. Sometimes we pre-wash to deliberately shrink the fabric, and sometimes it’s just a result. Remember that you need a certain width and length of fabric in order to cut out your pattern pieces. You’ll find the width that’s needed in your fabric requirements. 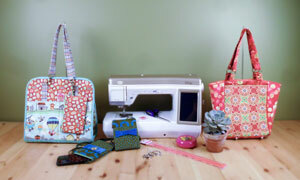 When using quilting fabric for bags you might require 40″ of useable width or 42″ of useable width. 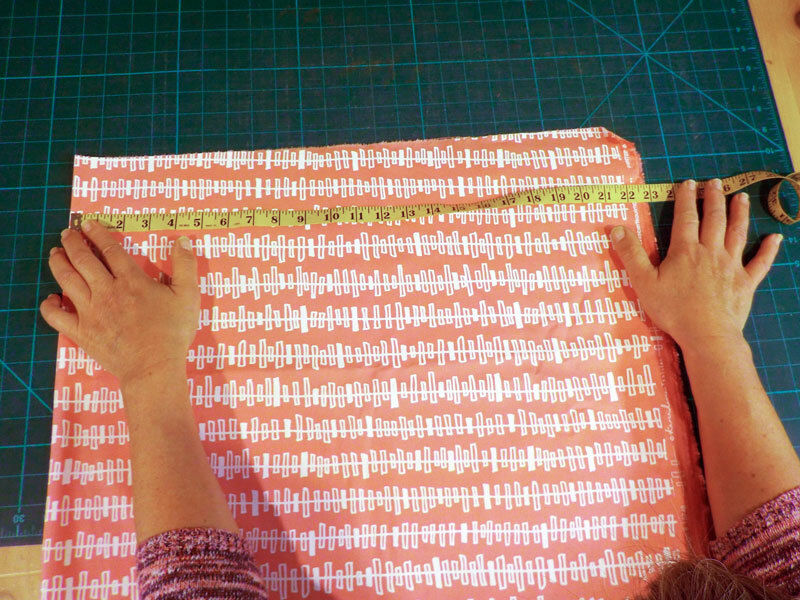 Shrinkage to the width and/or length will result in a shortage if you haven’t planned your fabric preparation. If you plan on laundering be aware that you might have to purchase extra fabric in order to complete your cutting. Before cutting it’s extremely important to press your fabric flat. There is no hope of cutting accurate sized pieces using rumpled fabric. 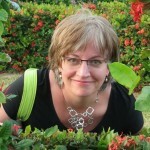 As they say “A stitch in time saves nine!” so take the time to do a great job of pressing. Accurate rotary cutting is extremely important. The old saying “Measure twice to cut once” really applies to bag making. You certainly don’t want to waste fabric and money by having to re-cut any of your large pieces. Invest in a 20 ½” square ruler or use the grid lines on a 24” x 36” grid cutting mat to achieve perfectly sized pieces.